I did finally begin my fall housecleaning. (Have I ever told you how much I hate the end of pool season?) The first room to feel my wrath was the main bathroom, which is the one that Denis and I share. This house was built in 1952 when most ranch-style homes weren't big on master bedrooms with ensuite baths, although we've made modifications that gave the guest room its own bath. My interior design preferences have changed over the years. For the most part, you can call my style No Frills. It's comfortable. No one's afraid to sit on anything, and I've long gotten over my penchant for dust catchers. My grandmother was the one in the family who caught dust before it had a chance to land on the furniture. Me? I tend to think of it as a protective coating (but I don't want that coating any deeper than needs be). I do like to have a few touches in our bedroom and our bathroom that are a bit "fancier." In the bathroom, I guess those highly paid designers would call them elements to give the bath a "spa-like feel." 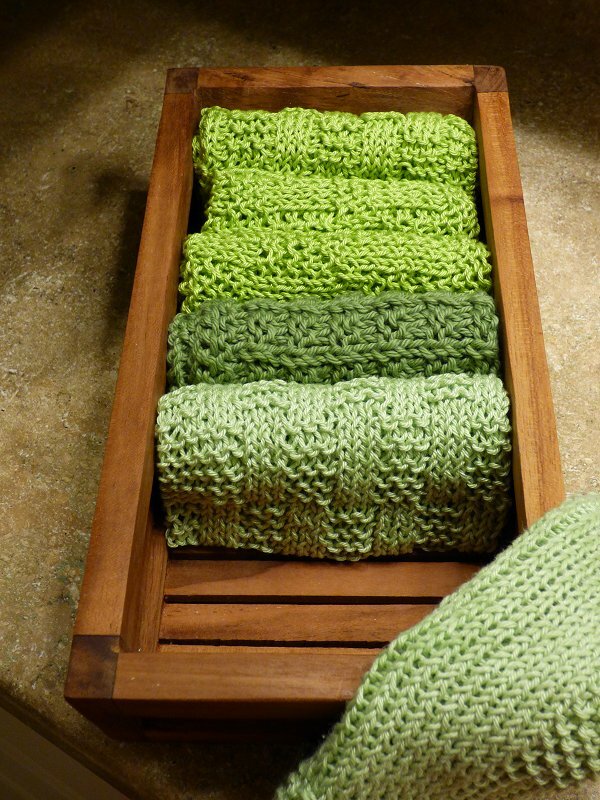 Here's one small way that I pamper myself: a teak box filled with handknit facecloths. As you can see by the one that's artistically draped over a corner of the box, I'm already using one. What made me laugh was Denis's remark when he came out of the freshly scrubbed bathroom: "I really like that box with the facecloths. Are they all for you to use...or can I use them, too?" You can deduce my answer by the two-cloth space in the box! It's funny how small touches can make a person feel special, isn't it? Now that I've got my face and hands washed, I'd better mosey on out to the corral. 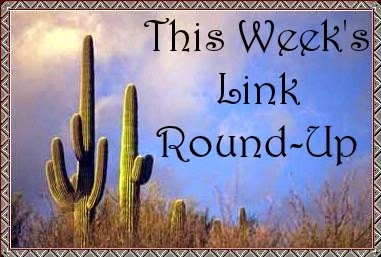 Those links sure have been noisy this week. Head 'em up! Moooooooooove 'em out! How citizen action saved the New York Public Library. The underwear of Jane Austen's time will make you seriously grateful for modern conveniences. Shirley Jackson predicted America's fetishization of the murderess. Why Coco Chanel created the Little Black Dress. Want to learn Cherokee? How about Ainu? This startup is teaching endangered languages. Experimental treatment partially awakens a man who's been in a vegetative state for fifteen years. And how about the cover controversy over The Letters of Sylvia Plath? Ancient fossils reveal the first humans emerged 170,000 years earlier than we thought. Ancient Native American rock art has been rescued from a warehouse. The ancient tomb of Santa Claus might have been discovered beneath a Turkish church. The 2011 tsunami flushed hundreds of Japanese species across the ocean. Wolf pups have been spotted near Rome for the first time in decades. Botanic gardens may be endangered species' best bet for survival. A lynx family turns an Alaskan photographer's deck into a playground. The incredible 30-day journey of a cargo ship in time-lapse shows what most of us will never see in our lifetimes. These breathtaking natural wonders no longer exist. On the move with the donkey-powered mobile libraries of Zimbabwe. Donald Malarkey, the war hero portrayed in Band of Brothers, has died at the age of 96. Seven books on female leaders to read now. The ten best books about the Philippines. Fourteen epic libraries around the world. Seven Shakespeare-inspired lingerie sets if you're in the market for something to make Hamlet blush. The 100 best screenwriters of all time. A visual vocabulary test from Merriam-Webster. Ten tales of manuscript burning (and some that survived). I really like the sound of that soap dispenser!